John Resig shows us the right way to complain about something… by not even making it appear you are complaining, and offering solutions. To SlideShare’s credit, they are pretty open to people’s suggestions. When I mentioned them last year, they commented on my post right away, which is always great to see. I’m really liking what John did, and I’ll see if I can tie into it with my workflow of using S5. 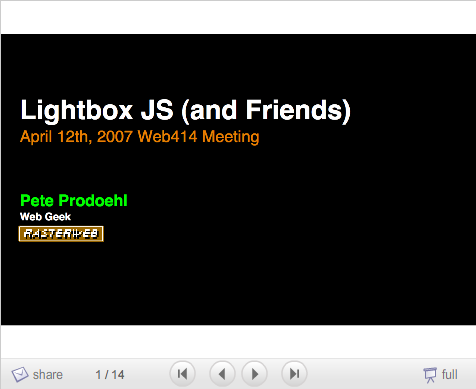 I did a short presentation for Web414 in early 2007 called Lightbox JS (and Friends). I used S5 because I like S5, it’s XHTML/CSS, it’s standards-based, it lives on the web and gets indexed. Anyone with a browser can see it. It takes no special software to create or consume. We accept PowerPoint (ppt & pps), PDF, & OpenOffice (odp) files. If you are on a Mac and use Keynote, export to “PDF”. So my complaint here is that anyone who plans put their stuff on SlideShare will most likely start with a proprietary and/or binary format. I know, I’m one of those crazy people who actually prefer HTML, but if SlideShare becomes the standard for sharing slides and presentations, it could be a bad thing. The conversion process I went through involved doing screen captures of each page of my S5 presentation, which on the Mac created PNG files. I then converted those to PDF files, and combined them into a single PDF I could upload to SlideShare. This was a short presentation and it still took me way too long to do. What SlideShare needs is an S5 importer (or really, just an HTML importer) just give it a URL and let it import your existing presentation. That would be cool.